While Regina searches for a "cure" for the Snow Queen, Snow and Charming try to figure out how she came to Storybrook in the first place. Emma finally goes on a date with Hook. More of Anna's story is revealed. Emma and Hook's costumes for their date were strangely 1950s inspired, but there was a lovely Lady and the Tramp reference. Before their date, Hook makes a deal with Gold to get his hand back, which, predictably, leads to less than ideal circumstances. Anna played a key role in Gold's ability to get his hands on the Sorcerer's Hat only to find out that her parents did indeed fear Elsa and sought the Dark One's help to rid her of her powers. 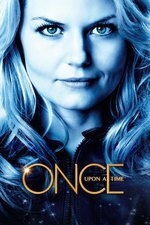 Henry, in an attempt to help Regina get her happy ending, goes "undercover" as Gold's apprentice. Oh and Will Scarlet breaks into the library. OK since no one else cares....one thing that bothers me about this episode is we don't know where on Will's timeline he is. I watched OUaT in Wonderland so I wonder where he is in terms of that show. It's a bit confusing. Makes me wonder if some of the other Wonderland characters will be showing up, which I wouldn't object to. At the start of the season I didn't care that much for how they were bringing in the Frozen characters, but I have to say that part of the show is growing on me.